Residents should be outraged at the processes involved with the development of this project. 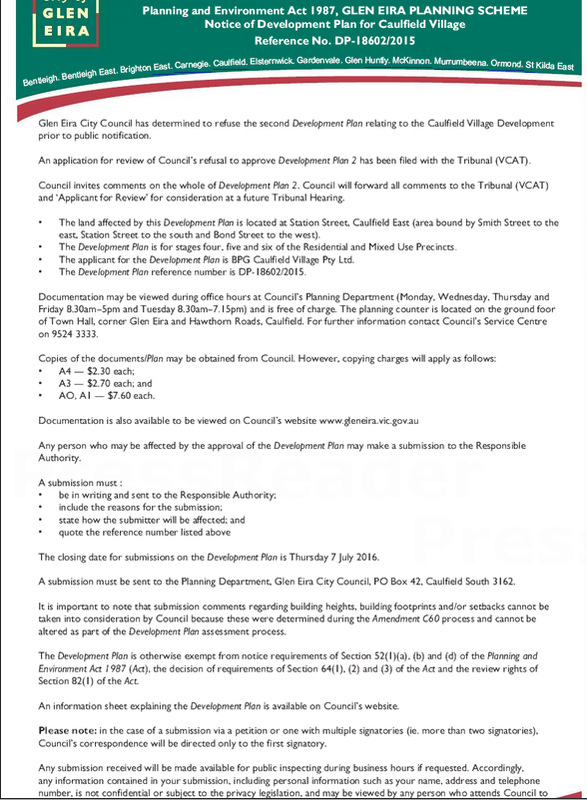 At last council meeting a public question was asked in relation to a Practice Day hearing held at VCAT on this application. The response was far from satisfactory. Be that as it may, plenty of questions need answering, and all have to do with due process and sound governance. When did council first receive this second stage Development Plan? Who made the decision to ‘refuse’ and why wasn’t this done via a formal council resolution given the magnitude of the plans and the contentious nature of the entire project? What was the purpose of the Practice Day hearing and what were the grounds for someone’s (not Council’s) refusal? What is the outcome of this hearing? If decisions by VCAT are already pending as potentially indicated by the response to the public question, what is the use of calling for submissions after the fact? In short, we maintain that every single aspect of planning for this site, has been abysmal with council and especially Hyams, Lipshutz, Esakoff and Pilling, falling over backwards to accommodate the MRC! That’s not the end of the story but the time they convert most of three bdr apts and a lot of the 2 bdr apts into 1 bdrs and add on an extra floor (because GE’s incompetent planning department didn’t define AHD height limits) it’ll be hitting the 2,500 mark. But that’s ok cause they will all use public transport and be quite happy with the work Council has done to beautify Redan Street as they walk up to Caulfield Park (because the MRC won’t let them the public park across the street, ie. the Racecourse). The incorporated plan is a joke. What’s up now is so different that the whole schedule should be rewritten and the application thrown out completely.